Chicken Blanco Enchiladas… These enchiladas will be THE BEST you ever have! The creamy blanco sauce is heavenly. The enchilada filling has just the right amount of spice and flavor. This dinner will become a menu regular and a new family favorite! I have quite a few goals for the new year. One of them happens to be to make a sit down dinner more often in our home. One where the family is gathered and we are able to talk about the day. I feel like with all the after school sports and activities my kids are involved in, we are lucky when we all get the opportunity to sit down together. Most of the time dinner is one or two at a time or on the go. It makes me so sad because I LOVE when my whole family eats together. 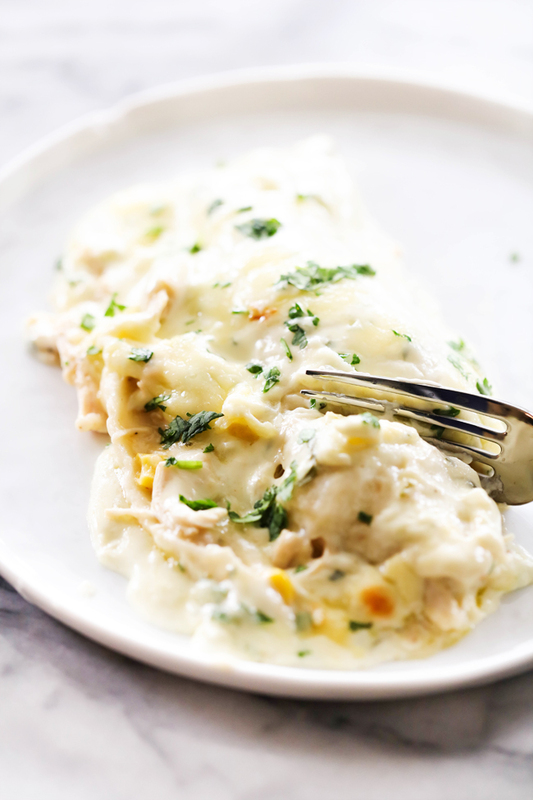 This Chicken Blanco Enchiladas brought everyone to the table. They smell so fantastic and everyone RAVED about them! These are honestly my favorite enchiladas ever! 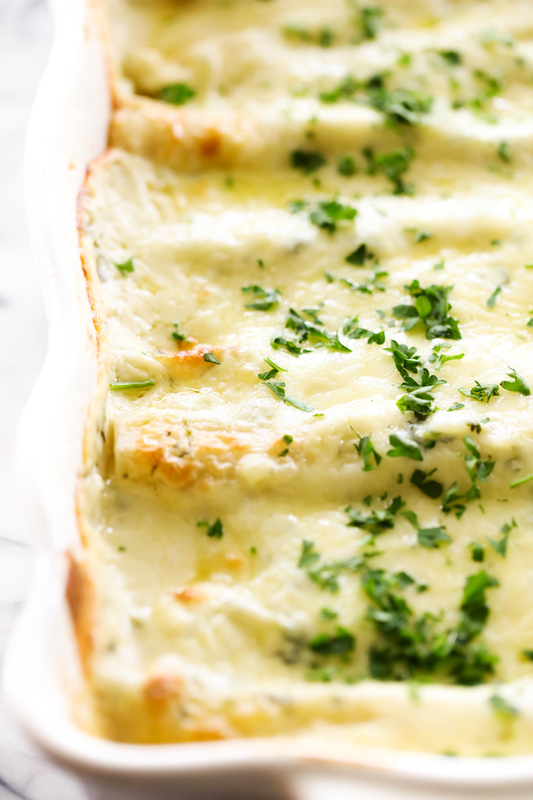 I love creamy enchiladas, I love blanco sauce and I love the green salsa flavor so naturally these were a win in my book. The best part was all my kiddos, picky eaters included adored them too. I love when I make a dinner everyone can enjoy and agree upon. Chicken Blanco Enchiladas... These enchiladas will be THE BEST you ever have! The creamy blanco sauce is heavenly. The enchilada filling has just the right amount of spice and flavor. This dinner will become a menu regular and a new family favorite! In a large mixing bowl, combine chicken, salt, pepper, shredded Mexican cheese, 10 ounce can green chili sauce, 1 cup frozen corn and mix well. Set aside. In a medium sauce pan, heat oil over medium heat. Add onions, and jalapenos and sauté for 4 minutes or until tender. Add cream and bring to a boil. Remove from heat and add Monterey Jack cheese and American cheese. Stir until melted. Spray a 9x13 baking dish with cooking spay. On flat working surface, lay out tortillas and place chicken in the middle of the tortilla, spreading it evenly across the center to the tortillas. Roll the enchiladas up and place them in the baking dish. Pour the sauce evenly over the enchiladas and bake for 30 minutes. Remove from oven and sprinkle the remaining Jack cheese over the top. Return to the oven for another five minutes and serve. The ingredients list has 1 cup green chile enchilada sauce for dipping the tortillas, but it's not in the instructions. I assume you do that just before you fill the tortillas? These look amazing! I can't wait to try them.